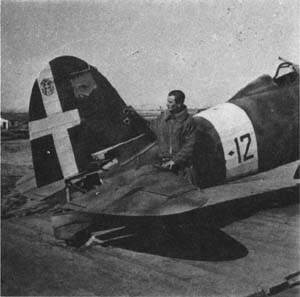 Sottotenente Francinetti showing the combat damage on his CR.42 sustained during a big engagement with Hurricanes and Gladiators from 80 and 112 Squadrons on 28 February 1941. Francinetti was wounded in the leg during this combat. In February 1941 Francinetti served in the 394a Squadriglia, 160o Gruppo C.T. At this time this unit took part in the Greek campaign and was equipped with Fiat CR.42s. On 9 February 1941 18 S.79s from the 104o Gruppo were out to bomb in the Kelcyre-Tepelene area. These bombers were escorted by twelve Fiat G.50bis fighters from the 24o Gruppo led by Maggiore Eugenio Leotta, and twelve Fiat CR.42s from the 160o Gruppo, led by Tenente Edoardo Crainz. Four Greek Gladiators of 21 Mira (Sminagos Ioanis Kellas (CO of 21 Mira), Anthiposminagos Anastasios Bardivilias, Episminias Ilias Dimitrakopoulos and Episminias Nikolaos Kostorizos) and eight PZLs from 22 and 23 Mire intercepted the formation. The G.50bis pilots in return claimed one Gladiator and three PZLs shot down, while the pilots from the 160o Gruppo submitted claims for three Gladiators (one each by Tenente Crainz, Sergente Maggiore Luciano Tarantini and Sergente Maggiore Aurelio Munich) and two PZLs (Sottotenente Francinetti and Sergente Antonio Crabbia). On the Italian side, the CR.42s of 160o Gruppo had been escorting four S.79s of 104o Gruppo in the Kuc area, between Tepelene and Himare, when British fighters identified as Spitfires, Hurricanes and Gladiators, were encountered. Two Gladiators were claimed shot down and one as a probable, a ‘Spitfire’ also being claimed. Sottotenente Francinetti of 394a Squadriglia landed back at base wounded in one leg, and Sottotenente Italo Traini of 394a Squadriglia was shot down and killed. Gunners in the S.79s also claimed two Gladiators shot down, as did the G.50bis pilots of the 24o Gruppo, the latter also claiming two more as probables. Tenente Bellagambi, following his combat with Flight Lieutenant Abrahams, was then shot down and wounded in one arm: he force-landed near Tirana airfield. Capitano Ettore Foschini's aircraft was also hit and he was wounded, also coming down at Tirana. In the beginning of March 1942, Regia Aeronautica spotted Chad-based Free French forces led by Général Jacques-Philippe Leclerc intruding into the Fezzan desert area, in the southern part of Libya, to harass Italian garrisons in order to distract forces from the northern front. The Leclerc column was formed by four independent patrols, the aerial support being provided by the Groupe Bretagne, composed of Nates and Rennes Escadrilles. The former was led by Lieutenant Jean Mahé and had four Martin Marylands (ex-French Martin 167s, known simply as ‘Glenns’) and a Potez 540. The latter, commanded by Lieutenant Marcel Finance, had five Lysanders and three Potez 29s. Leclerc had moved from Chad on 17 February and ten days later surprised and overwhelmed the small garrison of Uigh el Kebir. Here he established his command post and on 28 February his forces managed to capture the Gatrun and Tegerri garrisons, but a patrol led by Capitaine Jacques Massu met strong resistance at Umm el Araneb and was forced to retreat. As a result of the French aerial activity in Fezzan, Maggiore Michele Mandara, CO 160o Gruppo CT, deployed four CR.42s to Sebha, led by Tenente Eduardo Sorvillo (394a Squadriglia). The other three pilots were Sergente Maggiore Duilio Bernardi (393a Squadriglia), Sottotenente Piero Bertonasso (375a Squadriglia) and Sergente Antonio Malavasi (394a Squadriglia). A single S.79 of 175a Squadriglia RST was also sent as reinforcement, flown by Tenente Giuseppe Pellizzotti. The CR.42s undertook their first sortie from Sebha on 6 March, hunting French vehicles between there and Zuila, but without result. On 7 March, the four CR.42s at Sebha moved to Umm el Araneb. After a reconnaissance to Gatrun, while on the ground at Umm el Araneb, they were bombed and strafed by the French Lysander P9197 of the Rennes Escadrilla, flown by Lieutenant Marcel Finance. The fighter of Tenente Sorvillo (MM7627/394-8) was set on fire, the pilot suffering severe injuries, while Sottotenente Bertonasso’s CR.42 was slightly damaged. The pair of Fiats still serviceable took off immediately, flown by Sergente Maggiore Duilio Bernardi and Sergente Antonio Malavasi to hunt for the hostile aircraft. Sergente Maggiore Bernardi found the Lysander and fired at it repeatedly, forcing it to land in the desert trailing smoke. Lieutenant Finance took the gunner Sergent Chef Fernand Leroy, who had been wounded in the leg, out of the Lysander and sought the cover of the smoke. It proved only to be a smoke bomb hit by a bullet from Bernardi’s guns. Meanwhile, Bernardi flew for some time over the grounded aircraft without attacking it further. Convinced that he had inflicted irreparable damage, he then departed. This allowed Finance, having got the gunner back on board, to take off and fly back to Uigh el Kebir. At Umm el Araneb meantime, the wounded Sorvillo was put in an S.79 called to the spot and flown to Castel Benito. The S.79 (MM21465) flown by Tenente Pellizzotti subsequently crashed at Sebha for unknown reasons, all crew being killed. On 8 March, two more 160o Gruppo CR.42s were flown down to Sebha by Tenente Francinetti and Sergente Maggiore Aurelio Munich to replace the two which had been destroyed. Meanwhile, however, all the French aircraft left the area, retiring to their base at Faya in Chad, leaving Leclerc’s patrol without air cover. The next day, on 9 March, Tenente Francinetti and Sergente Maggiore Munich strafed Capitaine Massu’s patrol, leaving one vehicle in flames and others damaged. Francinetti’s CR.42 was slightly damaged by small-arms fire. In the afternoon Tenente Francinetti, Sergente Malavasi and Sergente Maggiore Munich again attacked Massu’s troops, this time near Uigh el Kebir, ten small trucks were claimed destroyed and others damaged. On 30 March an Italian patrol of 3o Compagnia Sahariana found the wreck of eight French vehicles. At this point the first Fezzan Campaign was at an end, French forces returning to Chad and the Italians garrisons being re-established. Francinetti ended the war with 1 victory, this one claimed while flying Fiat CR.42s. (a) Claimed in combat with fighters from 21, 22, 22 Mire. The 24o and 160o Gruppi claimed five PZLs and four Gladiators without loss. The Greek fighters claimed eight enemy fighters for the loss of one PZL while several more were damaged.